In this volume of the Good Audition Guides, you'll find fifty fantastic speeches for men, all written since the year 2000, by some of our most exciting dramatic voices. Playwrights featured in Contemporary Monologues for Men include Howard Brenton, Jez Butterworth, Alexi Kaye Campbell, Caryl Churchill, Ariel Dorfman, Ella Hickson, Lucy Kirkwood, Bruce Norris, Jack Thorne and Enda Walsh, and the plays themselves were premiered at the very best theatres across the UK including the National Theatre, the Donmar Warehouse, the Bush and the Young Vic, Manchester Royal Exchange, Birmingham Rep, the Traverse in Edinburgh, and many on the stages of the Royal Court. Drawing on her experience as an actor, director and teacher at several leading drama schools, Trilby James prefaces each speech with a thorough introduction including the vital information you need to place the piece in context (the who, what, when, where and why) and suggestions about how to perform the scene to its maximum effect (including the character's objectives and keywords). 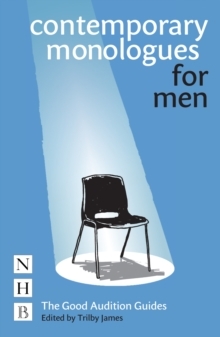 Contemporary Monologues for Men also features an introduction on the whole process of selecting and preparing your speech, and approaching the audition itself. The result is the most comprehensive and useful contemporary monologue book now available.